My days living in my Prius Campervan start at waking up early around 5:00 am. I then spend 5 minutes to look at the overnight mail and texts. Then spending 5 minutes looking at the national radar, as well as current and future surface weather maps. I turn on the podcast that I fell asleep listening to and figure out what I missed and listen to the rest. Then I'm out of bed and wet shave, wash my hair and then wash the rest of me, if I haven't done any of this the night before. I then brush my teeth. Then I'm on the road about 6:00 to McDonalds for my morning unsweetened iced tea and downloads of my podcasts and uploads of my pictures for my blog. It's close to 8:00 am when I leave McDonalds for hiking, disc golf, or drive. If going to a fair or other event I will go to a park to spend time to arrive as it opens. I eat fruit for breakfast along the way. My time in parks during the day are often time to blog, text, email, track expenses, and browse the web for information about my next travel spot. Around noon I make a sandwich if I'm hungry stopping at a park or where I hiked or played disc golf. 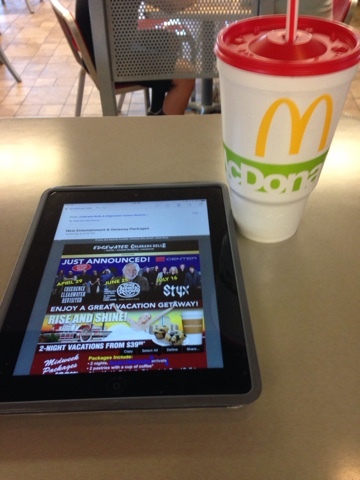 I then reverse my travels stopping at McDonalds for unsweetened iced tea and down/uploads. Around 6:00 pm I head to where I'm staying for the night, provided I know where I'm going. If I don't have a destination for a place to stay I will take time in the afternoon to find a place so I'm not trying to find one in the dark. With low ground clearance with the Prius I need to know where I'm driving as its too easy to scrape or hit something. Of course there are my weekly laundromat visits and every few days to buy groceries. Also the random oil change need to get done as well. Sounds like a good routine. I enjoy spending time in city and county parks. Do you do heavy-data-usage internet activities at McDonald's and lighter activities elsewhere using your cell phone data plan? How much cell phone data do you use in a month? I have two data heavy activities. Uploading photos for my blog. As you know most of my blogs are picture heavy. I could reduce their size with an app but that is another step I'm not ready to add to my day. Second is podcast downloads. I download hours of podcasts a day and this also takes a lot of data but not as much as uploading pictures. During my last travels I had 5 gigs of data and even using WIFI I would often use 6 gigs. Paying an extra $10 a month for the overage. This year I have 10 gigs with rollover and I'm doing fine. Note I also teach online but this doesn't usually use a lot of data.